Winter League Weeks 8 and 9 Results. We have just completed the first half of the fixture list and every team has played each other once. Panthers (Jimmy Graham and Co) continue to lead the table. But their amazing run of 7 wins out of 7 came to an end last week when their nearest rivals Eagles (Brian Cruise & Co) beat them in the top of the table clash! Patriots (James Nolan & Co) and Saints (Kevin Behan & Co) have started a late charge, winning their last two matches. This week the Saints take on league leaders Panthers and the Patriots take on Eagles. Will the Panthers stumble? Can the Saints and Patriots continue their recent form? The Bears (Eoin Boggins & Co) take on the Broncos (Noel Murphy & Co), and win for the Bears could move them into second place. With nine matches to be settled over the next 8 weeks it is still a wide open competition. 14 Hole Course. The Course is set for Blue Tees, 1-7 to Red Flags & 8-14 to Yellow flags, NOTE: early starters are reminded: If Frosty Please put in White Flags and play from Orange Tees, to avoid any damage to Main greens. 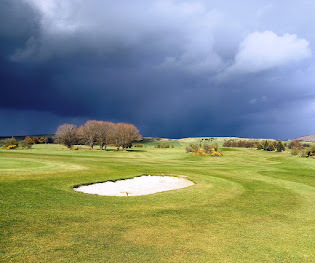 January looks set to be a difficult month for Golf at DMGC, with December rainfall amounts the highest for over 100 years. The cattle hoof damage on the 17th hole has not recovered yet and combined with the heavy saturation it may be out of play for week or two. Another example is on the 13th, I wanted to move the flag onto the Temporary green before Christmas, but the Temp 13th green and surrounds were wetter than the main green. Hopefully conditions will improve for next weeks competitions. You will see a sign at 7th Green, directing you to play the par3 14th, this is the 1st hole of your back 7 holes. For the final hole play the normal 16th. Mark your card as set out on the 14 hole card, do not swap scores on holes around. Enter scores onto computer leaving 15,16,17 & 18 as blank/0 and click enter. We have been informed that our current AIG Golfers insurance will rise to €27 this year. Brian McNamara has contacted AON insurance and it is proposed that we switch to their package @ €25, which will cover us from April 2016 to April 2017. The committee is requesting members who have not already renewed their annual subscription, to add the €5 increase to the clubs portion of the subscription which now rises from €55 to €60. For those who have already paid their subscription for the year the committee requests that you place the €5 in a sealed envelope marked INSURANCE PREMIUM INCREASE with your name and GUI number and give it to any committee member or leave it with Fiona or Deborah at the office. Click here for AON schedule of benefits. Changes will take effect on 1 January 2016, with an implementation date for clubs of 1 March 2016. The new CONGU manual is in the process of being published and is the culmination of a four-year review cycle with the aim of assisting club members to have handicaps which truly reflect their playing ability. • Continuous Handicap Review: To assist with this process there will now be a computer generated report which highlights those players with 7 consecutive 0.1 increases. Handicap Committees are now recommended to review the performance of such players and to give due consideration to applying a handicap increase where applicable or required. • Exact Handicaps: In Ireland lowest exact handicap is now restricted to 1.0 stroke increase in a calendar year. Jim McArthur, CONGU Board Chairman, said: “The CONGU Unified Handicapping System does not stand still and, as a result, we again have a number of further refinements to the system reflecting both experience and new evidence.